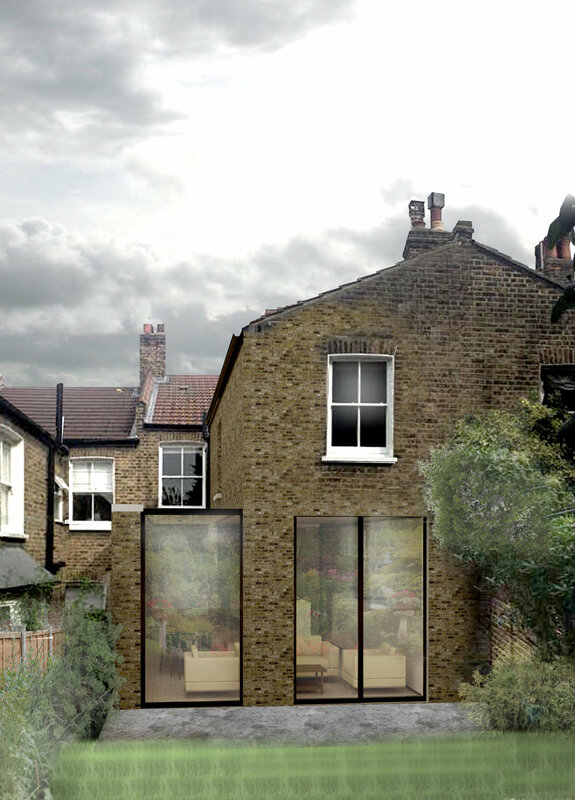 The proposal is for a side extension situated at the rear of the house. 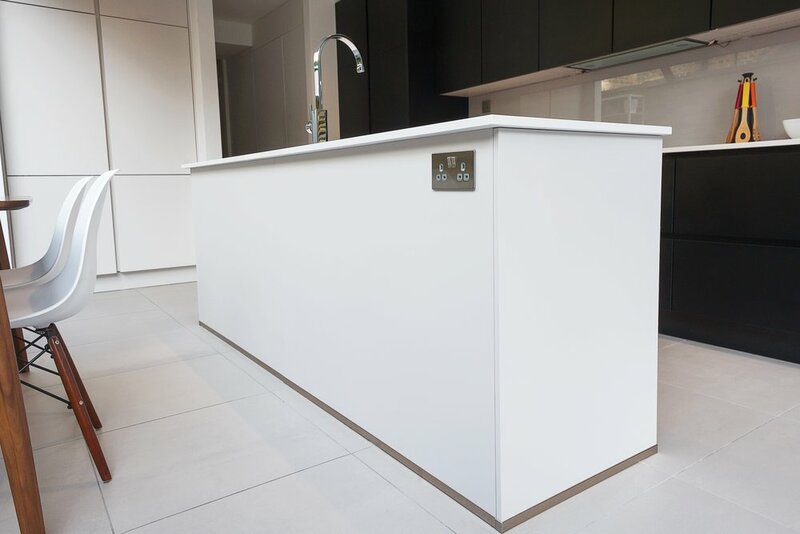 The proposed extension will fill the gap between the party wall, from the owners’ side only, to the existing outrigger side of the existing kitchen to create a larger kitchen/dining area for visiting family. As the proposed extension is relatively low, we do not anticipate there being any problems with the planning issues of rights to light or overbearing, as a notional 45degree line projected from next door’s window cill clears the top of the extension. 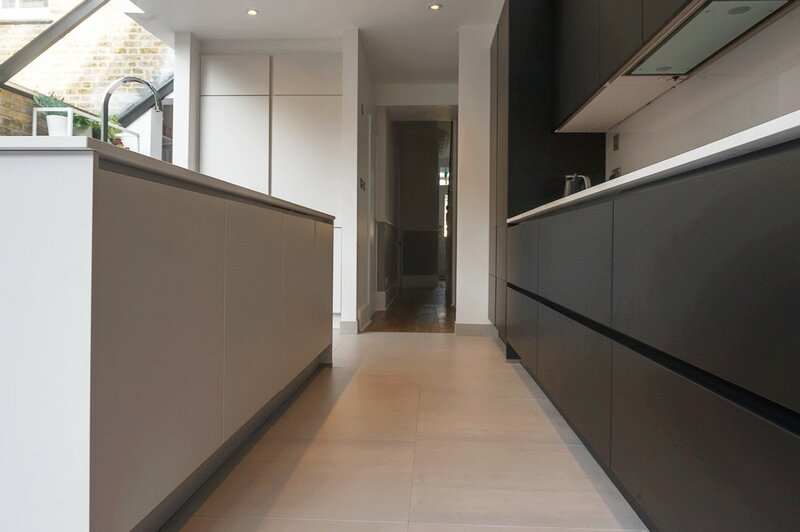 This proposed kitchen would be accessed from both the existing corridor and a newly formed opening from the existing living room, which will be formed where the existing rear window is located. This window shall be filled partially at the top to create a wall to fix the sloped skylight and reduced in width to allow a thin shelving system. 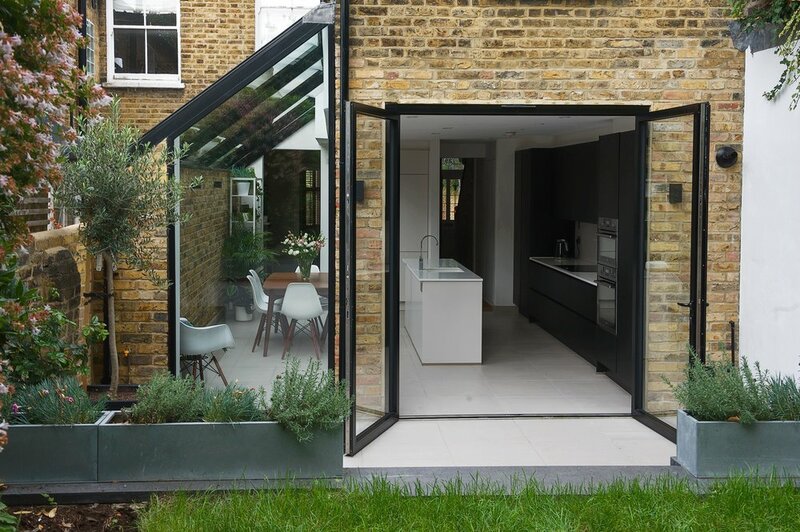 But opened below to the ground to create an opening for access to the extension. In the existing corridor there will be the addition of a new W.C., a walk-in storage unit and a cupboard for a washing machine and prams. This will extend the corridor into the kitchen. The proposed extension has been designed so that the existing outrigger rear elevation retains its walls on the side – rather than removing all the ground floor side and edge of rear walls. When looked at as a whole- the ground and above are integrated still- so that the extension reads as being added to the side and the outrigger retains its integrity. The extension’s roof incorporates a sloped mono-pitched skylight to reduce the massing on the side and rear elevation. 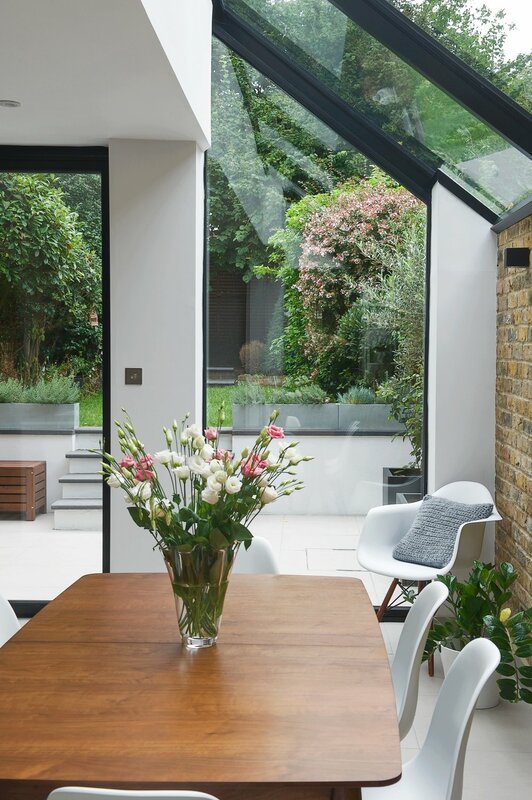 It is predominantly made as a glass panel that forms a long strip skylight that will abut a fixed glass panel on the new elevation and abut the rear of the existing house, where the window is infilled on the side and top- above the opening in the living room. This sloped roof therefore allows a maximum amount of sunlight into the neighbouring house and prevents overbearing and shading. It also allows a maximum amount of light into the living room in the middle of the house. 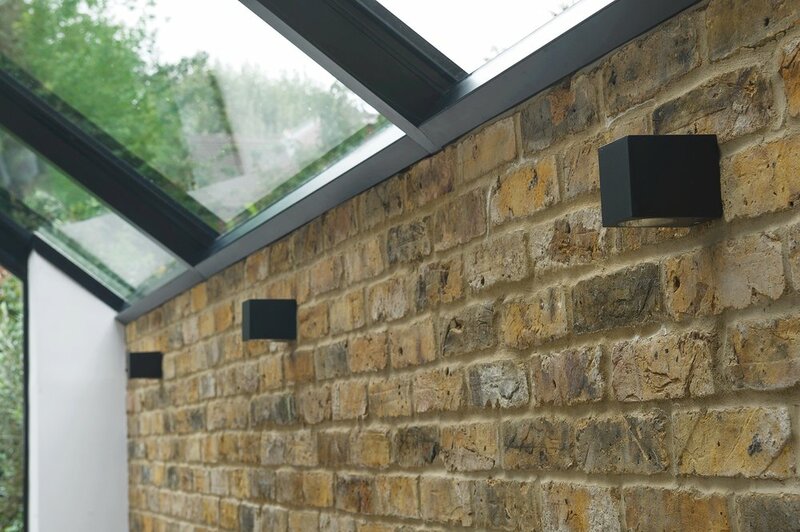 The façade is modern, yet also incorporates re-used London stock brickwork to match the existing. 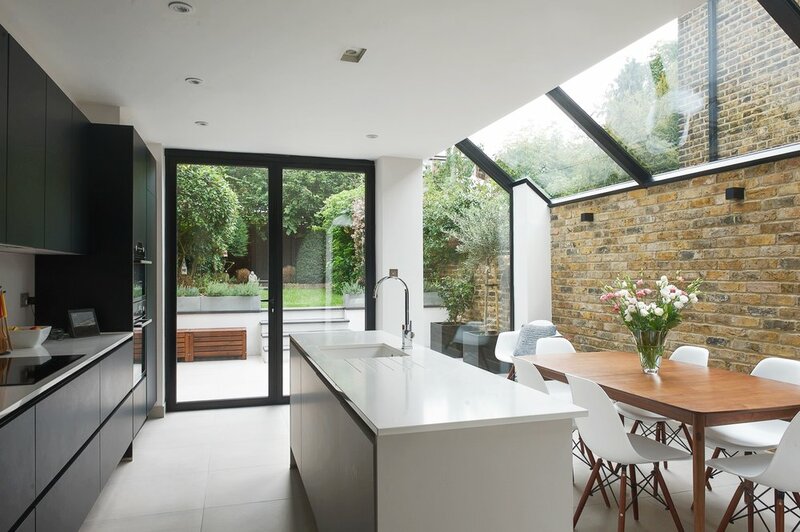 The use of traditional materials to match the house is contrasted with the modern glazed façade that allows maximum sunlight into the kitchen and enhances the linkage to the garden. Half of this glass façade will be a single fixed glass (frameless) panel, which will be fixed with stainless steel channels rebated into the existing brickwork to the new brick party wall[HA1] . A galvanised steel hopper will be used to take water from the proposed valley gutter on this new party wall. The edge of the existing outrigger is retained and therefore the elevation lines-through vertically. 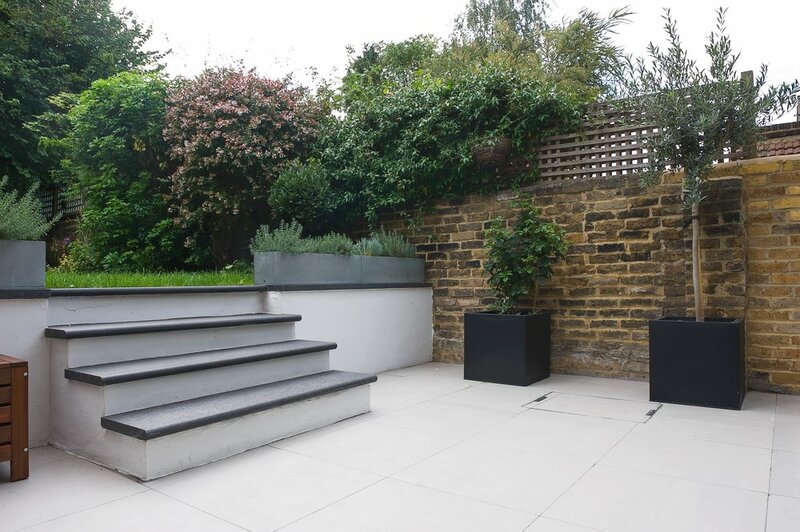 A new patio will be constructed to be level with the kitchen floor and the garden redesigned to integrate the extension with the garden. 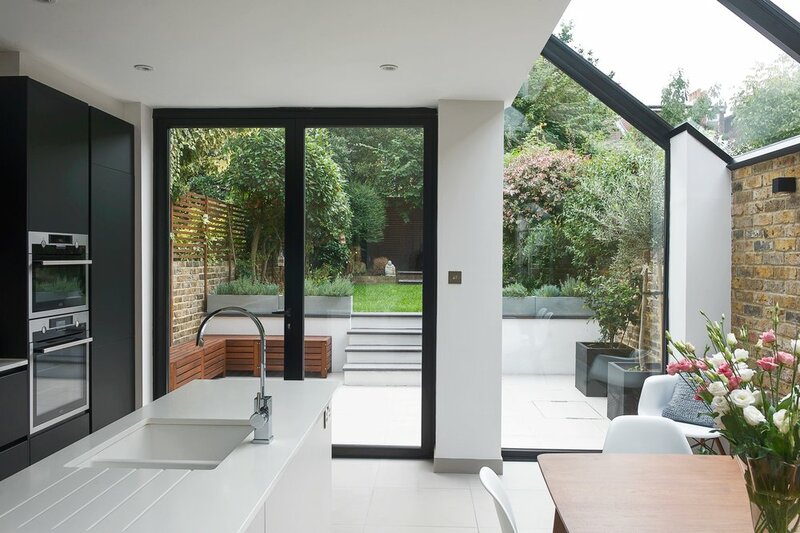 This small extension of only 11.7m2 would enhance both the internal layout of the house and external elevation and the garden. At present, the alley is neglected and ad-hoc in character with a bay window looking onto a fence. Also the kitchen is similarly ad-hoc and confused in layout. The proposal is to remove the rear W.C. and open the rear area to make for better views to the garden and creation of space for a much needed larger, family dining table for the extended family. The existing high fence and planting along the boundary will not be built above and this allows the extension to be covered. Also the gardens will be replanted and designed to refresh the space, which is presently underused and neglected due to the existing layout of the house. This modest proposal would enhance the house and living quality of the household generally.